Advanced rocket launcher installed on a mini truck. Photo by: Freedom House. Since the beginning of the Syrian conflict in 2011, many observers and analysts have been questioning, how does the Free Syrian Army arm itself? The first event of the uprising took place in Dar’a city in south of Syria, after the world had seen two toppled presidents in Egypt and Tunisia, the “Arab Spring” as US president Barack Obama named it, became a very popular discussion in all Arab streets and in many playgrounds. A group of Syrian children in Dar’a were playing in a local playground and started using some of the slogans that became popular in the uprisings in Tunisia, Egypt and Libya. When word reached the Syrian security forces that these children were using slogans such as “The people want to topple the regime”, they invaded the area to apprehend them. The children’s families decided not to keep silent and to protest with loud voices as they demanded an immediate release of their children. However the regime’s security forces used extreme violence to end this unusual protest in a country whose people are often too gripped with fear to speak out of injustice. After the invasive entry of security forces to the city of Dar’a, other major cities in Syria such as Homs, Lattakia, and Hama expanded their peaceful “unarmed” demonstrations, demanding an immediate release of the children and an immediate withdrawal of security forces from Dar’a. Bashar Assad promised his people basic reforms, more freedom of speech, allowance to form political parties and easy permissions for demonstrations, however, all Syrian citizens who believed these reforms, were arrested after they asked for permissions for their demonstrations to ask for more political and democratic reforms. All attempts of the Syrian regime failed to stop the protests as people started to expand their actions all across the country, demanding the topple of the regime. The Syrian regime, however, flared up its action and started to use heavy troops and weaponry against the people including mortar artillery, tanks, air forces against villages, cities and all kinds of infrastructure. Many soldiers of the Syrian army started to defect and arm themselves to establish counter insurgency with lower standard of weaponry to Assad troops. Meanwhile, the regime was bedding on the limited military capabilities of the defected Syrian army, which could be defeated compared to its capabilities, however, more soldiers and officers defected and started to use heavy military tools against the regime all across the country. Syrian president Bashar Assad, claimed on western media networks that droves of “Terrorists” had crossed the borders into Syria, being armed by other countries to fight the Syrian army in an unjustified global conspiracy led by the United States of America against the entire region. The absurd conception that Assad presented to the world is that the United States of America is inextricably linked to Al Qaeda to fight the Syrian regime. This conception had never been believable or realistic for Syrian rebels, regional states, or American allies, but Obama’s administration didn’t give that much attention to the Syrian crisis as he is focusing on the healthcare program and other economic reforms in his country. Assad wanted sympathy from the International community to fight “Terrorism” as well, he got fully backed by Russia and Iran in the crisis by arming his troops and bailing out the Syrian national central bank with foreign currencies to boost the Syrian pound to protect it from falling front of the US dollar. As the crisis turned into a destructive civil war in Syria, the support of Iran, Russia, and Hezbollah militia in Lebanon didn’t terminate the crisis in the benefit of Assad. Meanwhile, general leaders of the Free Syrian Army have been complaining of being neglected by the International community and Arab governments as they suffer from lack of arms and weapons that they need in their fighting against Assad troops. The cause of the Free Syrian Army has got more complexities, locally in facing the boosted Assad troops, regionally as fears appeared from neighbouring countries of being pushed into the Syrian war, and internationally by the American and European neglection for the Syrian crisis. Defected military airport officers planned to target any Russian or Iranian air forces that lands in both military or civilian airports to prevent the regime from collecting more weapons, but this strategy was not fruitful, because targeting air forces is extremely hard with primitive weapons and precise targetting is necessary to hit the plane. The main strategy then was attacking the military airports themselves, because that’s where modern and fatal weapons are being stored. The Free Syrian Army divided its forces into small groups to slowly attack the airports and to target weapon’s storage, but the next step is more difficult because it requires to impose a prolonged siege against the airports to prevent air forces from landing. Assad’s regime had had around 27 military airports across the country, the most important airport was in the province of Aleppo (Mannag airport), the battle of this airport took more than six months until the Free Syrian army could take control of it after it ousted the regime troops. The Free Syrian army started to take weaponry from the regime stores in the airports and other military bases, thereby making the war more balanced as both sides are now more equally armed. 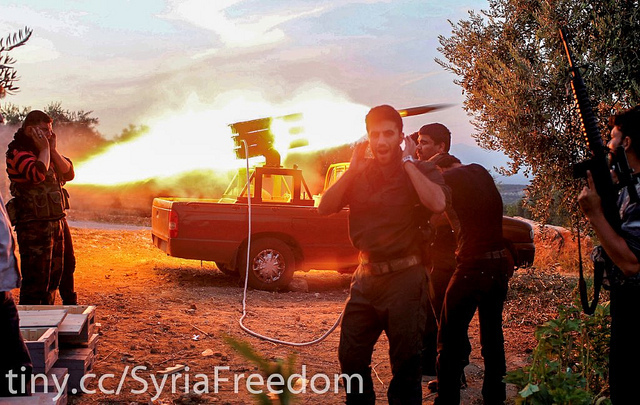 From another point of view, the Free Syrian Army could survive since the beginning of this crisis which began in March, 2011 because the defected Syrian soldiers got creative in manufacturing more primitive weapons, which could resist the superiority of Assad’s troops who had more developed weapons had been sent from external players in the war such as Iran and Russia. The weapons seized from the airports and military basis along with the creative manufacturing skills of the Syrian society in general, imposed a different equation on the ground. Even though the use of archaic tools to manufacture primitive weaponry, there ingenuity eventually led to a more balanced confrontation against the Syrian regime, without an actual need for official arming from other countries such as the United States, European countries, and Arab countries.